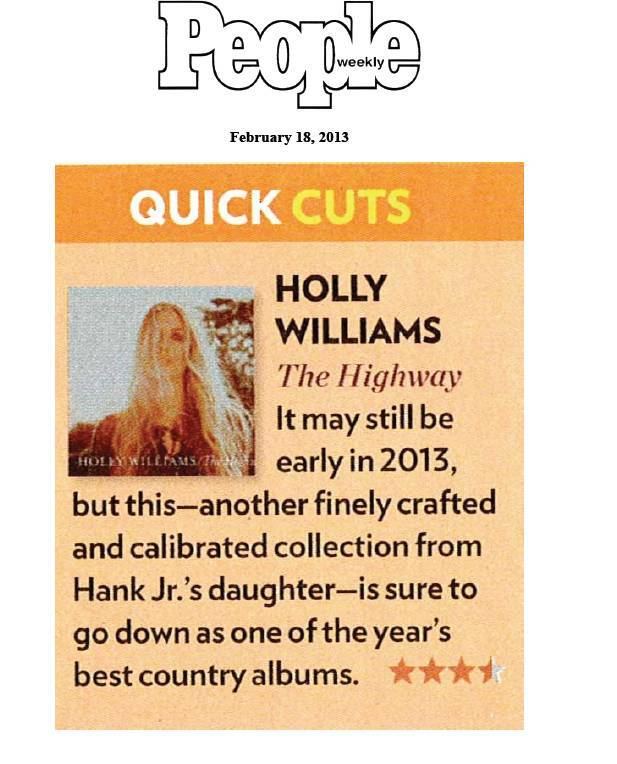 Discussions Magazine Music Blog: HOLLY WILLIAMS: The word is out! The Highway is gaining traction! HOLLY WILLIAMS: The word is out! The Highway is gaining traction! Irvine, CA – Super D Independent Distribution (SDID) is excited to be the exclusive U.S. distribution partner of the new CD/LP Vinyl project “Highway” from Holly Williams, grand-daughter of the legendary Hank Williams that streets on February 5, 2013. Leading up to the street date, Holly Williams will perform on NBC’s The Tonight Show with Jay Leno on January 30, 2013. Hailed by American Songwriter as a “sophisticated, introspective singer/songwriter” and as having “a lovely, ever-on-the-verge-of-breaking voice, and knows how to sell a song” by The Washington Post, critically lauded Nashville-based singer-songwriter Holly Williams will self-release her third studio album, The Highway, on Georgiana Records February 5, 2013. Co-produced by Charlie Peacock (The Civil Wars) and Williams, The Highway is the follow-up to 2009’s Here With Me, and is Holly’s first record as an independent artist. Additionally, the album features guest vocals from Jackson Browne (“Gone Away From Me”), Jakob Dylan (“Without You”), Dierks Bientley (“’Til It Runs Dry”) and Gwyneth Paltrow (“Waiting On June”). Featuring 11 original compositions of “serious-minded, heavy-hearted songwriting she’s done all along,” (Nashville Scene), all songs were either written or co-written by Williams. Writing collaborators include Christopher Coleman (“Happy,” “Let You Go,” “’Til It Runs Dry”) Lori McKenna (“Without You”), Sarah Buxton (“A Good Man”) and Cary Barlowe (“’Til It Runs Dry”). Recorded at The Art House in Nashville, the album was engineered and mixed by Richie Biggs, with additional engineering and mixing by Nick Autry, and Chuck Ainlay. The daughter of Hank Williams, Jr. and granddaughter of the legendary Hank Williams, Holly released her debut album The Ones We Never Knew (Universal South) in 2004. The follow-up Here With Me (Mercury Nashville) was released in 2009, earning high praise from The New York Times, The Los Angeles Times, USA Today, People, Entertainment Weekly, American Songwriter, NPR Weekend Edition Sunday. “It’s a privilege for Super D Independent Distribution to represent Holly Williams. “Highway” is a soulful roots masterpiece that her fans will love as much as I do.”, said Pip Smith –GM of SDID.